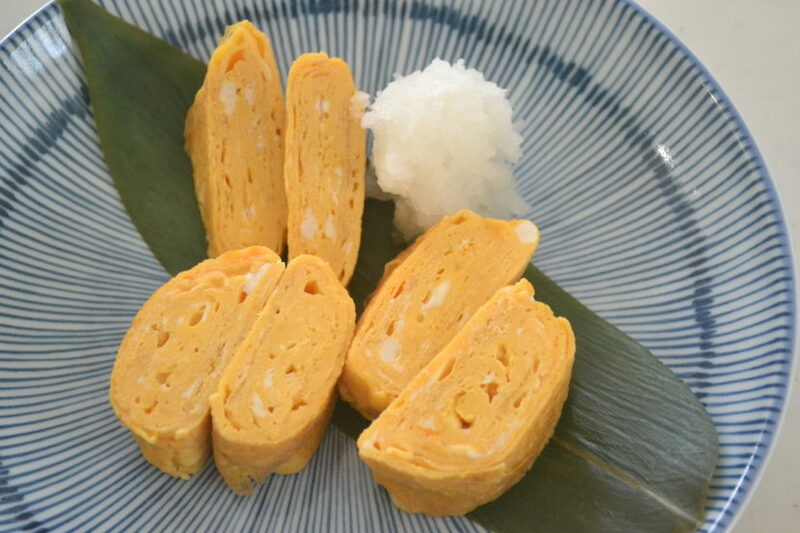 Today, I will be showing “Tamagoyaki” Japanese omelet. Everybody love it so much that can’t live without it. My recipe is a kind of “Kyoto style” which contains no sweetener. Its savory aroma of dashi is very hearty. I make “Tamagoyaki” 6 days a week for my son. It is so tasty that you will never get tired. 1. Mix seasonings in a small bowl. 2. Beat the eggs well. Add seasonings and mix thoroughly. 3. Heat the pan to really hot. Put some oil and spread evenly with a paper towel. 4. Pour one-third of egg mixture into the pan and spread the surface. Roll up the eggs from the top toward you. 5. Oil the surface, and pour next one-third of the egg mixture. Run the mixture through the first layer. Roll up while it is not cooked yet, to stick to each other. 6. Repeat the process again. Cook little bit further while rotating the Tamagoyaki. 7. Cut into bite size, and transfer to the serving dish. I like to eat with grated daikon radish. That combination is truly authentic. You can find it in a high-end soba restaurant. I recommend having a bottle of “Mentsuyu” in your fridge all the time. You can easily make “Tamagoyaki” everyday without bothering the seasoning. I am sure that you will like it! Just give it a try!